Much has been said about the dispute over the top-level domain .amazon between the two nations Brazil and Peru and the e-commerce titan Amazon. When ICANN offered new TLDs, Amazon was quick in applying for .amazon but it faced a stiff competition from Brazil and Peru, two nations among the ones through which the river Amazon flows. They convinced the ICANN GAC (Governmental Advisory Committee) to issue a consensus advice objecting to this issuance of .amazon to amazon.com. In their plea, they stated it was somehow hurtful to the people of the region and maybe sometime in the future they might find a good use for it when it wouldn’t be available. REALLY? While talking to fellow industry folks, I found that even though most shared the above sentiments. However, there were also folks who felt that this is a strategy to control the internet by top 4 or 5 companies. Unlike the more popular extensions like .com where people are free to register what they want, these new extensions will be under the absolute control of these corporates who can decide whether to allow someone to register it on their TLD. An avid traveler, foodie and reader, Animesh is passionate about the world of domain names and loves to tie bits and pieces of information together to form the bigger picture. 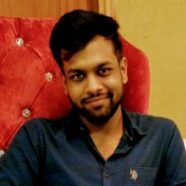 Animesh is a graduate from the prestigious Indian Institute of Technology (IIT), Varanasi, one of the elite institutions of India.